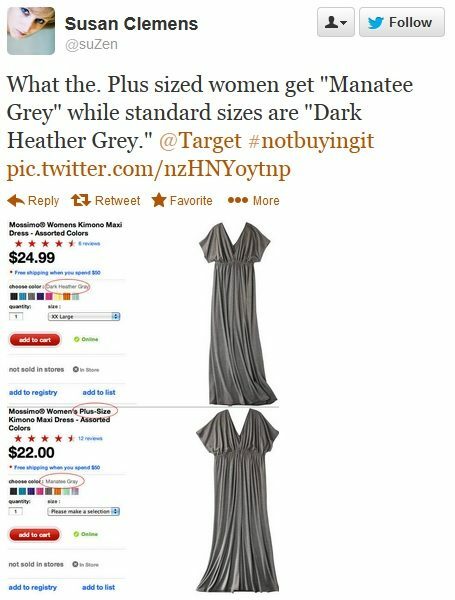 Target is coming under fire after one woman called to attention on Twitter that a dress in regular sizes was described as "Heather Grey" but the same dress in plus-size was described as "Manatee Grey." Manatees are also known as sea cows. Susan Clemens, a self-described "Digital Maven", tweeted Target about the dress discription on April 3, saying "What the. Plus sized women get "Manatee Grey" while standard sizes are "Dark Heather Grey." Target tweeted back to Clemens the same day, "We apologize for this unintentional oversight & never intend to offend our guests. We've heard you, and we're working to fix it ASAP."